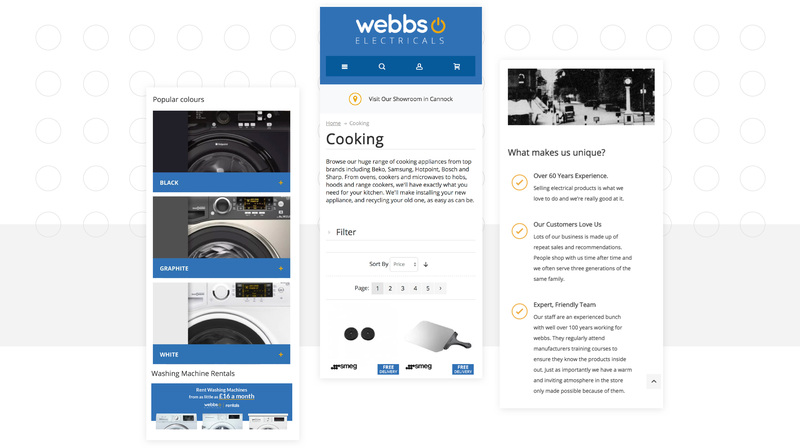 Webbs Electricals is an omnichannel appliance retailer that is part of the Euronics group with a reputation for amazing service that goes back over half a decade. Webbs had faced issues with their previous site and took this as an opportunity to relaunch with a brand new design and modern functionality. A simple but modern refresh of the logo was important to help customers continue to see Webbs as a friendly and professional brand. The introduction of bold colours and a rounded font help evolve that tone in order to help continue to grow the identity as the new website and style was built. Wanting to take the burden out of appliance buying, there was a key emphasis put on customer journeys and overall ease of use. From a design perspective, a fresh logo and custom landing pages were some of the elements magic42 brought to the table. Fully responsive across desktops, tablets, and mobiles, Webbs’ site has also been optimised for speed across each of these devices. 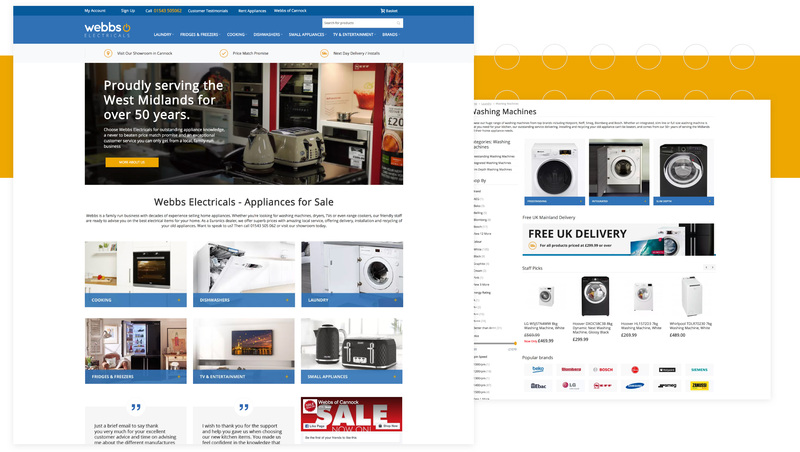 magic42 also developed an intelligent banner promotion engine to remind customers, at key points in their purchase funnel, that Webbs is an authorised reseller of huge brands such as Hotpoint, Samsung and Bosch. Webbs were keen to take advantage of a variety of advanced functionalities across their site, pushing the boat out on what core-Magento has to offer. Algolia is one of the leading search providers across nearly every platform, providing lightning fast and accurate results that can be adjusted to almost any aspect of a product. magic42 handled the integration and configuration of the engine, allowing Webbs’ customers the chance to find exactly what they are looking for. Taking into account the various customer journeys that can be taken when purchasing appliances, the mega-menu was a major priority. Incorporating distinct images and a direct category structure, every care was taken to ensure the right products were put in front of customers. The unlimited number of fresh & elegant labels allowed individual promotion. This allowed visitors to quickly see highlighted features of the products such as Offers, Brands or Energy Ratings. All of this visible straight from the category pages, allowing customers to easily scan through the page, leading to a higher conversion rate.